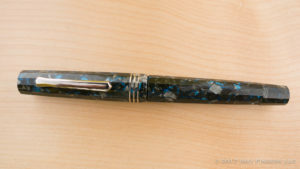 Corrections to the video above: This pen color was released in 1996. 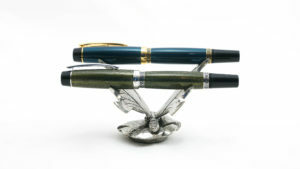 The smaller version(s) of the pen were the International and the Demi, not the Heritage as stated. The text describing the comparisons was wrong. (Reused from an earlier photo). 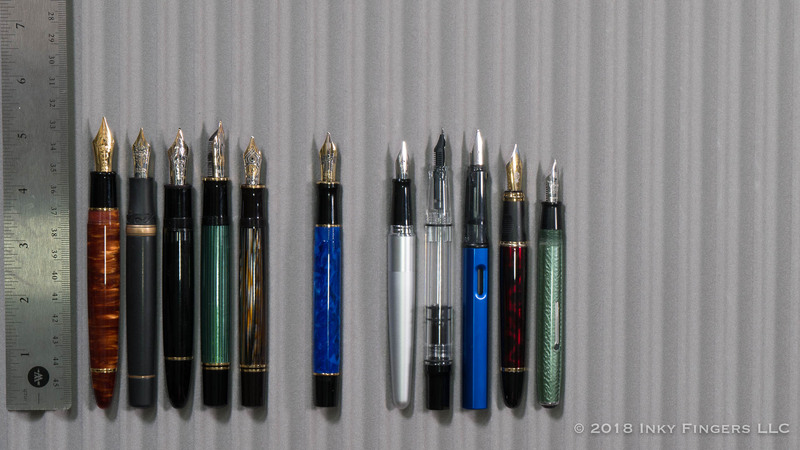 The correct order is: Classic Pens LB5, Visconti Homo Sapiens Bronze Age, Montblanc 149, Pelikan M1000, Pelikan M800, Parker Centennial Duofold, Pilot Metropolitan, TWSBI Eco, Lamy AL-Star, Jinhao x450, Esterbrook J. But the modern Parker is a very different beast than the Parker of seventy or eighty years ago. It has changed ownership multiple times, closed historic factories, and even began outsourcing most of its manufacturing. Design innovation has slowed (or even stagnated, some might say.) 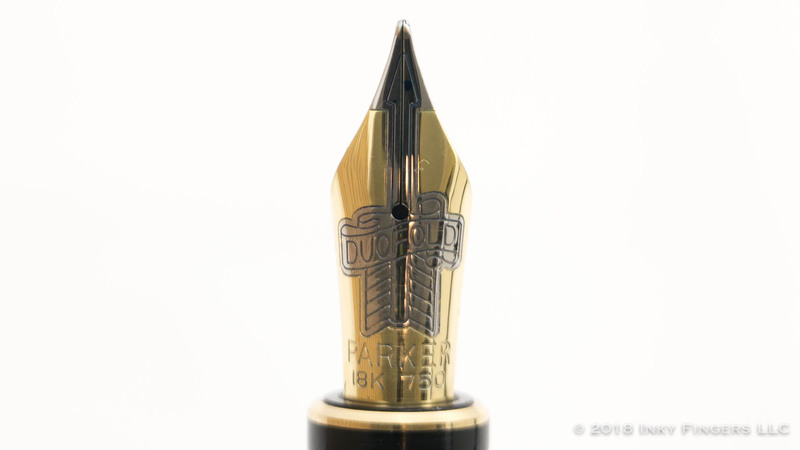 Today’s Parker is but a shadow of its former self. 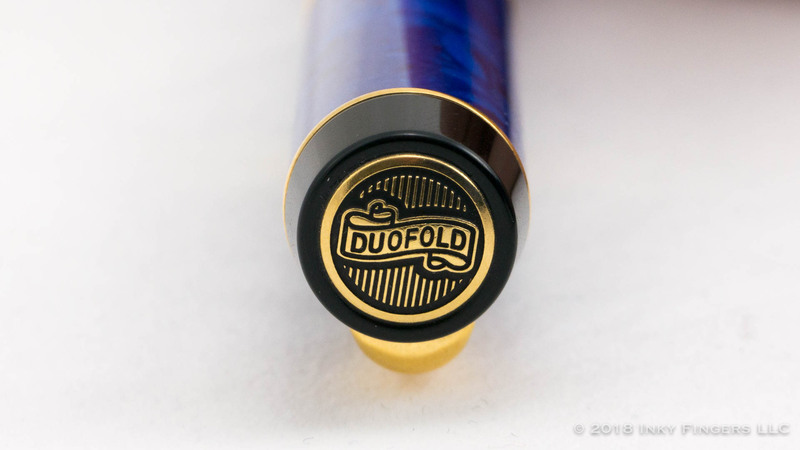 My Duofold Centennial is a lovely pen. 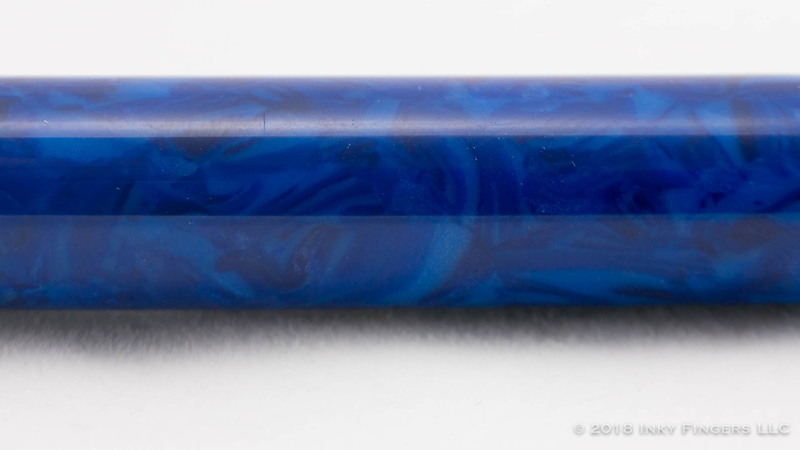 The Lapis Lazuli acrylic is more opaque than other acrylics with this much motion in them, which gives is a very unique, almost flat, look. The cap is topped with a trapezoidal finial into which is inset a gold-colored metal medallion with a lovely, vintage-feeling medallion. 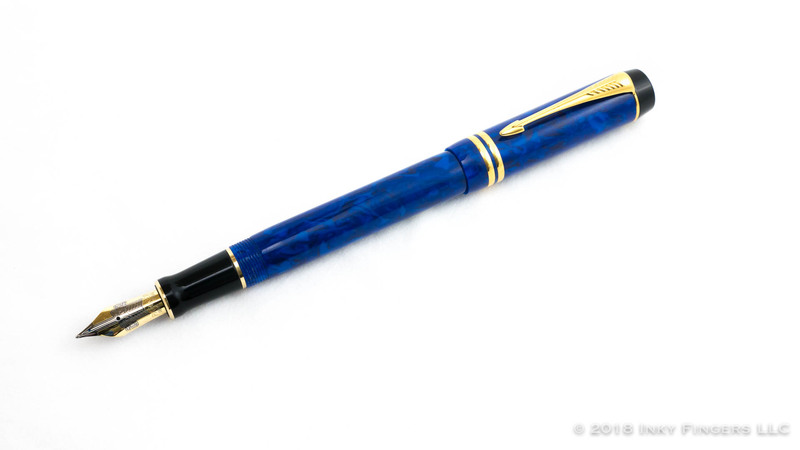 The cap’s clip features a slightly updated Parker Arrow design, although the modern iteration lacks the depth and detail of some of the originals. It feels more like the design was stamped in rather than cast that way–particularly around the arrow’s fletching. 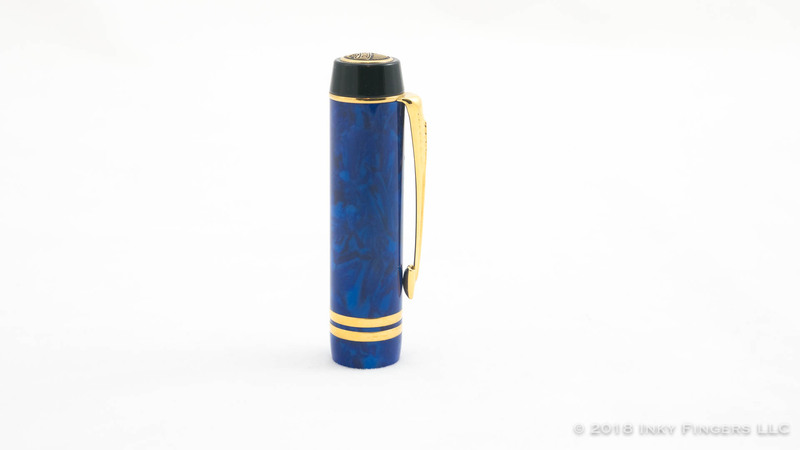 The cap is finished off with a double band in the same gold plating as the clip. 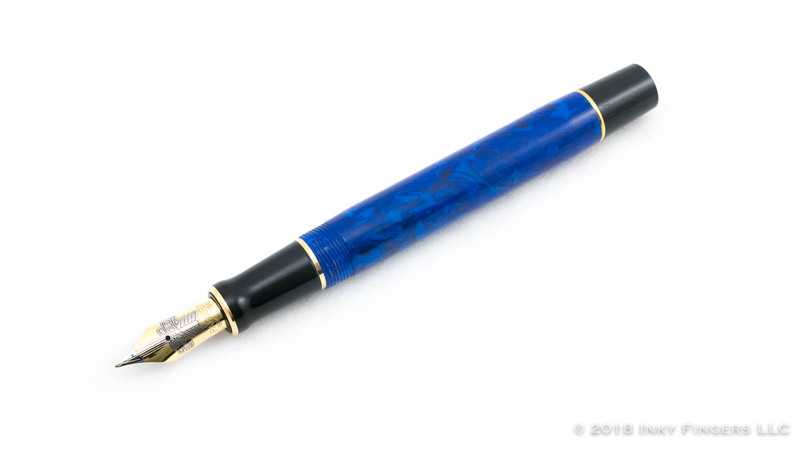 The barrel of the pen is relatively straight-sided, but does have an almost imperceptible swelling toward the back end which gives it a slightly more “organic” feel. 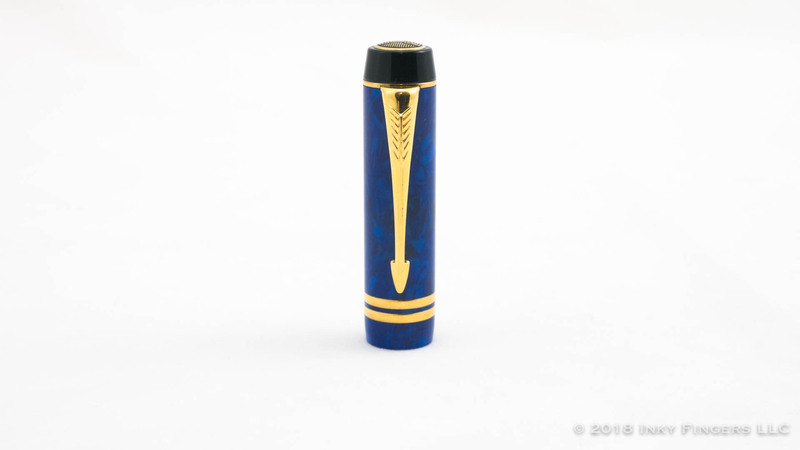 The barrel is capped off with another gold ring and a black, flat-ended finial that is similar to the one on the cap. 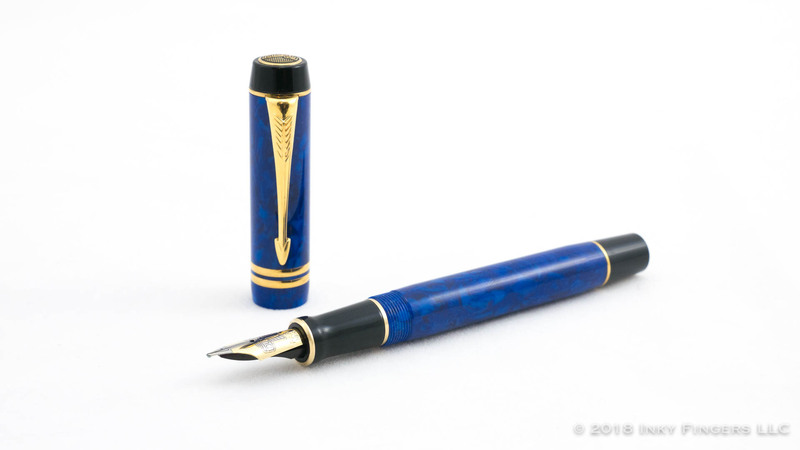 The cap twists on very smooth threads to reveal a black acrylic section and a very attractive 18k gold nib. 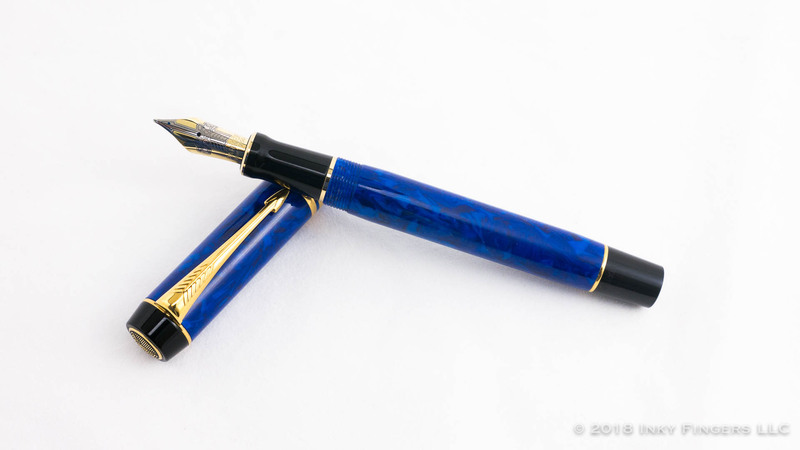 This is a cartridge/converter pen, and uses Parker’s proprietary system (which will also work with Aurora-branded cartridges and converters). 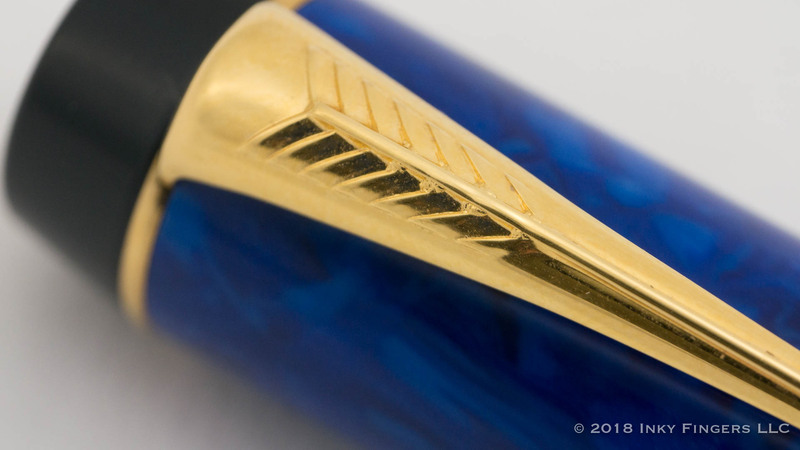 The section’s tenon is metal, and so this pen is not a candidate for eyedroppering. 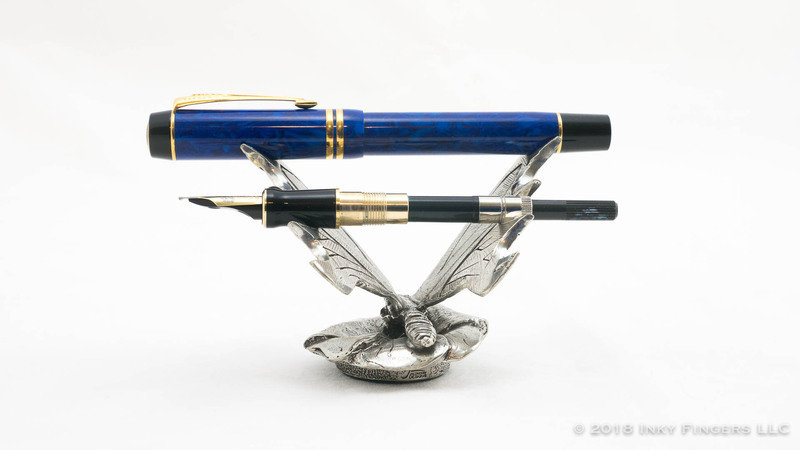 As a pen meant to signify the company’s centennial anniversary (they were founded in 1988), Parker didn’t skimp on the nibs they used for these pens. The bi-color custom design pays hefty tribute to the art deco and the contemporary design movements of the company’s heyday, while still being a modern interpretation. 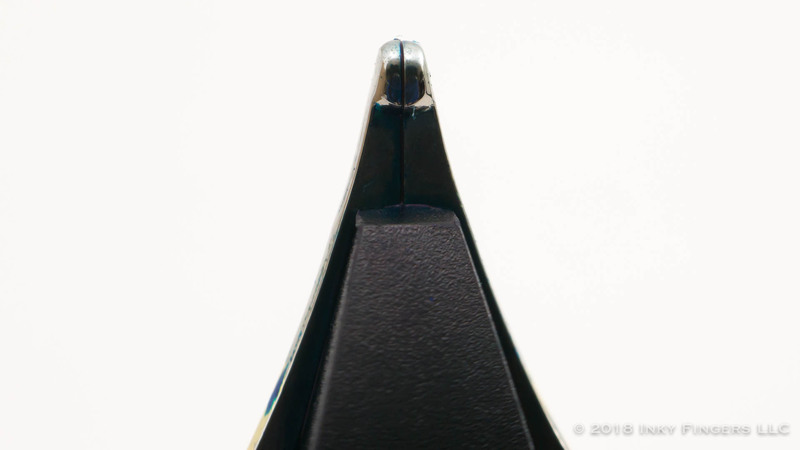 In particular, the silver-colored arrow design makes this nib feel long and lean, but very strong. In terms of writing, this 18k gold medium is a good, but perhaps not great, writer. As you can see from the macro photo above, the grind is a slight bit on the stubbish side, and the ink flow is generally moderate. There is a minor amount of feedback, but nothing I could consider unpleasant. In fact, most of the time, it’s actually an extremely good writer. What keeps it from being great is that every now and again it will behave a little oddly. It will feel temporarily dry or a bit feedback-heavy. 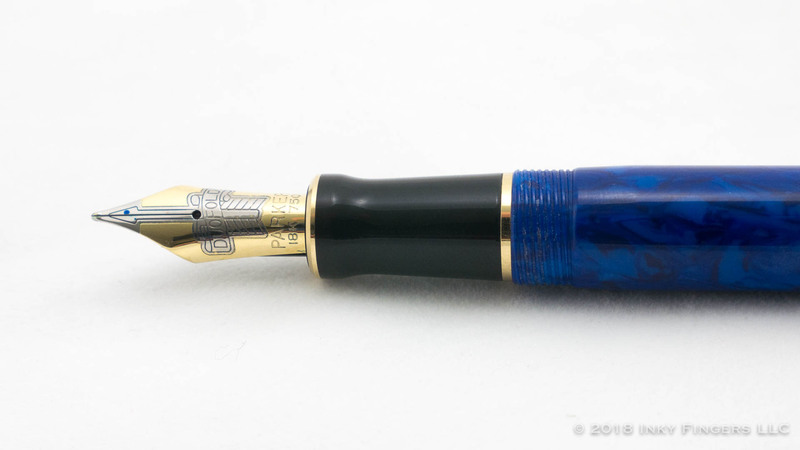 This intermittent issue seems to be exacerbated when the pen has sat inked, but unused, for longer periods of time. When in regular use, it appears to behave better. However, it’s still a very good writer, and a minor adjustment (the kind I could do myself) will almost certainly turn it from a good writer into a great writer. In the hand, I find the hand extremely comfortable. 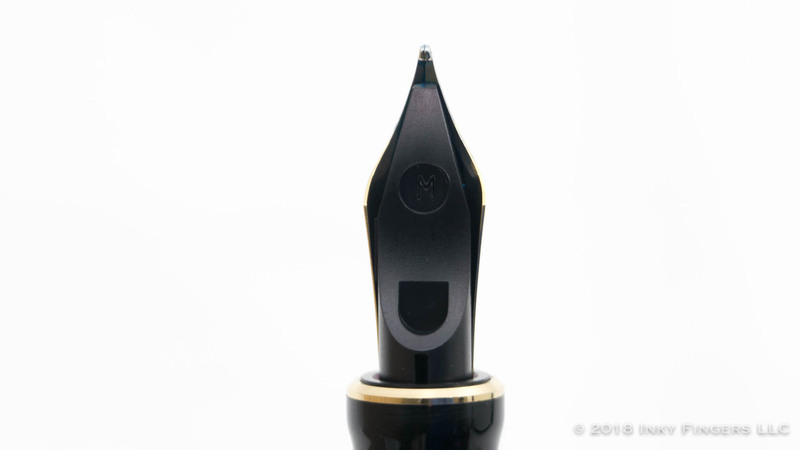 The metal in the tenon pulls a bit of weight toward the nib, leaving the pen nicely balanced. 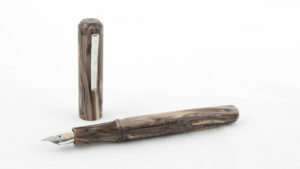 It’s long enough to use unposted, which is good, since posting the pen makes it approximately the size of a putter. It’s well-balanced and light, and very attractive. 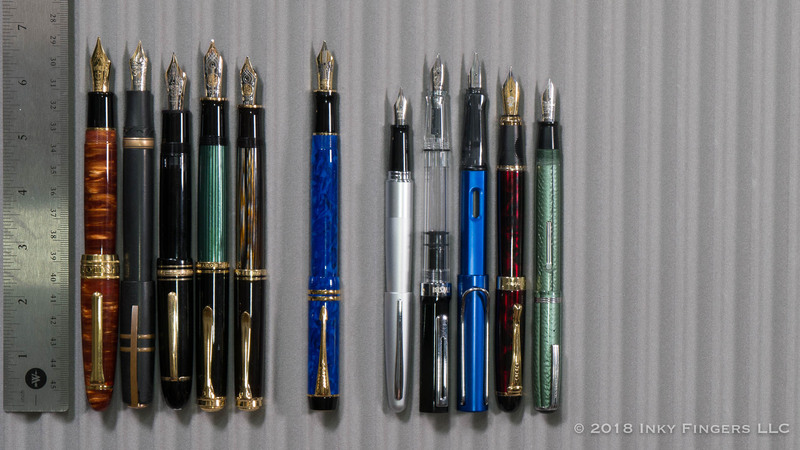 These days, the Parker Centennial Duofolds are a relatively common sight at pen shows. If you’ve missed out on a discontinued color, chances are you can find it at one of the larger shows. Their prices can range pretty widely depending on the material & rarity of the particular model, but the more common models haven’t seen a huge bump in value since their original offering. 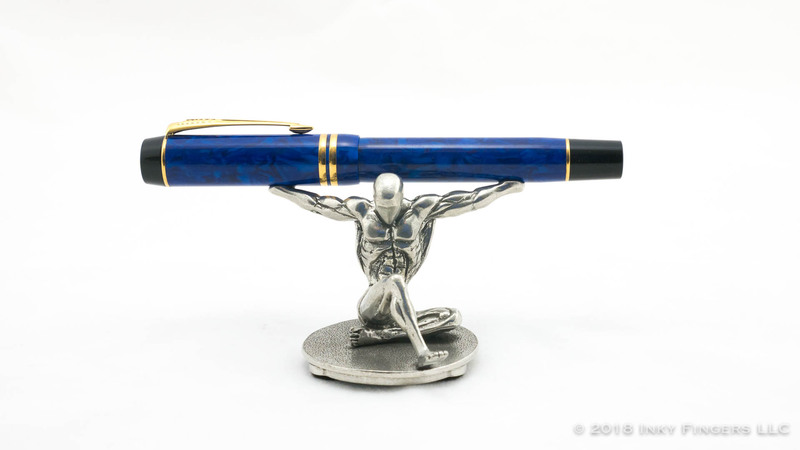 I bought this pen at a show for around $350. 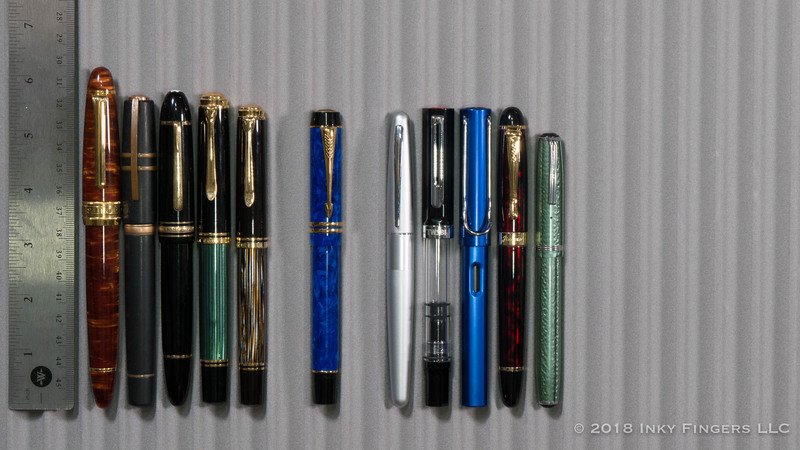 These pens often sold for around $400 list price in 1996 (about $640 in today’s dollars), so they’ve not appreciated much in value in the last 22 years. But they’re a very nice pen. 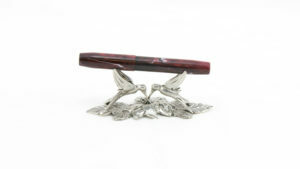 And if you’re looking for a collection of pens that’s easier to find than the original Duofolds or Vacumatics, this is an area where you could still easily work to build out a complete collection from a well-known brand.